Journey with me, if you will, back to the magical peninsula on which is situated that most unusual of cities, San Francisco, a gleaming wonder, 7×7 miles of living myths, tree huggers, dog lovers, and Banana Republic wearers. Directly south of the city center is a sunny, burrito-scented patch known as The Mission, not A Mission, or Mission, or Mision, but “The Mission.” Its population is divided more and more evenly between feather-wearing hipsters and the more original hair-gel wearing latinos. Dolores Park lies at the heart of The Mission, a park named for the nearby Mission Dolores, and the site from which the nearby restaurants have taken their carnitas recipes, perfected by Father Junipero Serra in the year 1779, the year of The Great Carnitas Cook-Off. 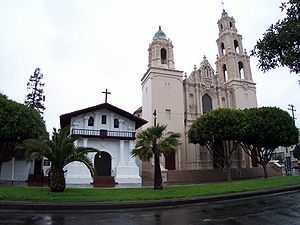 At the time of its founding in 1776, Mission Dolores was one of 18 different missions located in the city, each run by a brother of the same mother. The founders of these missions were drawn to SF because of its reputation for being a liberal lighthouse and a place where people could have a go at being themselves. In general, they disapproved of this laissez faire attitude and wanted to shut it down and end the rampant short-wearing that was going on at the time. So 18 brothers came out to the city and each one set up his own mission, with Father Junipero Serra choosing the rather wise location of what would come to be known as The Mission—sunny and flat, it was both easy and pleasant for the friars to bike around and get their morning lattes. Next to God, the Holy Spirit, and Jesus, the Serra brothers loved them some good carnitas. In addition to the prayers and confessionals, in each of the missions was also non-stop innovation in the realm of this delicious fried pork dish. Each week, the brothers revealed their latest carnitas creations and the parishioners would rejoice and partake. After about a year, however, with the congregations growing and the general population feeling over-served by the well meaning but all too present Serra brothers, it became painfully obvious that 18 missions in such a small area was probably too much. The short-wearing problem was already under control, and the brothers were getting tired of meeting potential parishioners only to find they were already in attendance at their brother’s mission. It was decided at a family meeting that only five missions were to remain open in the city, and that those missions would be chosen in a great carnitas cook-off. Each brother rushed off to their mission and began preparation for the carnitas battle. On September 17th, 1779, the day before the contest, Father Junipero Serra prayed a mighty prayer to the Lord. And the Lord did hear Father Junipero’s prayer, and his carnitas that day were filled with a holy flavor that none has ever tasted the likes of since. His brothers and parishioners alike were in awe of the indescribable flavor, and rumor has it that some shouted for Junipero’s immediate sainthood upon tasting his saintly creation. And thus his mission, Mission Dolores was named The Great Mission, and he stayed in the city along with his five favorite brothers. Over time, The Great Mission was corrupted to just The Mission, and the name was given to the area within the carnitas sway of Father Junipero. And that was fake history. Because research takes time. “Al pastor” is a roasted pork dish that I consider slightly superior to carnitas, though I love both. So the question is: what church had a pastor with such talent? A better question is: what church could I go to today and get some tasty tacos? You might have to come south for that LA and Orange Counties have more good Mexican food than Mexico has. Okay, what are carnitas? And what happened to the Indians? Carnitas are deep fried pork and God’s gift to man. The indians left of their own accord, I believe.